We awoke to the rainiest day yet, rain so forceful hard that our umbrellas did little to protect us—it was beautiful. Ken, stubborn husband that he is, didn’t bring an umbrella because he “hates” umbrellas but today he gladly mooches off me. Anna and I name him the umbrella moocher as he tries, to no avail, to stay dry beneath our umbrellas. We decide to make our way to the D’Orsay Museum as an indoor activity along with every other tourist in Paris. The square next to the D’orsay looks like a flower garden with all the umbrellas sprouting up. The line didn’t move an inch while we stood there. We decided to go to the movies instead of waiting in line to see Beginners—afterall the French love the cinema and going to a matinee is as common as café au lait. Here’s the cool thing about seeing movies in Paris. 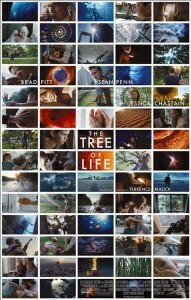 Most movies made in the U.S. are shown in Paris in their original English with French subtitles. The other thing you should know is that popcorn in France is awful. It’s been popped somewhere else and brought in bags so it’s stale–save the calories for a creme brulee after the movie. We walked outside after the movie and the sun was shining. 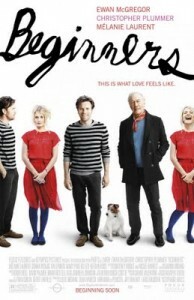 I felt that was God’s symbolic way of saying that Beginners is the better movie. 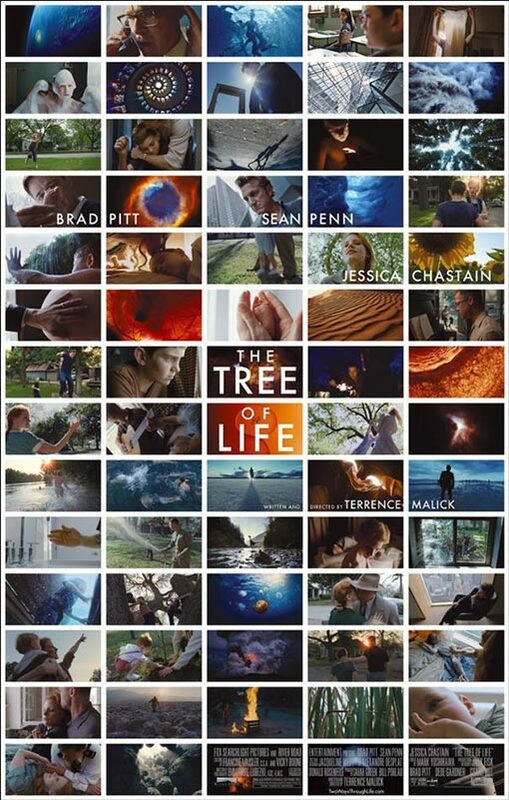 Of the two films one won a at Cannes but another won our hearts. Yesterday, Ken, my husband, arrived in Paris remarkably energetic. He had just endured a 12 hour flight and yet he didn’t appear to be tired. He said he had a client who was French and they told him about the wonders of French maritime pine bark extract, pycnogenol, for jet lag. It’s sold at health food stores and you take it three days before your flight, then take it twice on the day of your flight. When Anna and I arrived in Paris, I struggled to stay up until 5 P.M. and she lasted until 8 PM. So if Ken could stay awake until 8 p.m. I would have been astounded. He insisted on having lunch and followed by a day of sight seeing. Anna and I obliged but smirked behind his back knowing that he wouldn’t be awake for long. We walked to the Hotel de Ville for the Impressionist Exhibition, free to the public, but two-hour wait forced us to change our plans. Plan B: we took the Metro to the Opera Garnier, the magnificent opera house built during the Paris Reconstruction Project. 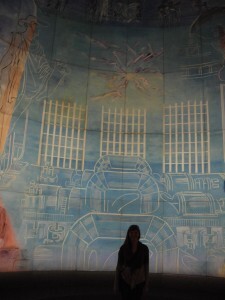 The building is eye-candy, so rich and luxurious that it resembles a painting by a master. It inspired the Phantom of the Opera with it’s underground lake and death of a person when the 8 ton chandelier fell from the ceiling in 1896 and killed a person. 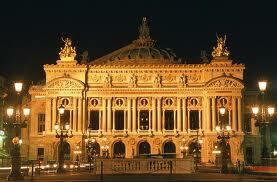 “Ready to go back to the room?” I asked Ken after the Opera Garnier. If Vivaldi didn’t put Ken to sleep like a lullabye, nothing would. I looked over at Ken as we listened to the ethereal music and although I saw his eyelids flutter but he was still sitting upright. He enjoyed the concert and emerged ready to go to dinner. We walked to a local’s favorite not far from Saint Chapelle called the Rose of France. Located on a little side street, the restaurant’s menu appealed to us all. I ordered roast chicken, Ken ordered lambchops and Anna had the good old standby—a hamburger. While we waited for our dinner we watched an art class taking place in the park across the street and the most adorable dog, very french looking, a cross between a dacschund and a terrier, black white and brown frolicked amidst the serious artists. The dog went from person to person and we couldn’t tell who was its master. Finally Ken couldn’t stand it any longer, he had to go play with the dog, and he scratched its neck, and roughhoused with it until the dog chased him and barked at him. It was all very entertaining and then our wonderful meal arrived. We had warm chocolate cake for desert before heading back to the hotel. Now, after a big dinner, Ken would definitely be sleepy, I thought. We prepared to go to bed, snuggled into bed with a book and at 11 p.m, finally, Ken turned out the lights. He slept 8 hours and woke up today feeling terrific. He’s an advertisement for the virtues of French Maritime Pine Bark extract. The sky was gray when we left Paris for Versailles,we sat side by side and Anna handed me one of her headphones so I could share her iPod on the ride. Air in the train car had a delicious Saturday morning feel as the weekend stretched before us. Mackelmore rapped on Anna’s iPod, the rhythm in sync with the train on the tracks, an urban soundtrack. Out the window, a gritty view passed by–graffiti-covered walls, Metro stops, laundry hanging from apartment windows. A man behind us talked loudly on his cell phone, oblivious to the dirty looks from passengers. An accordion player jumped into our car and played a song I recognized from the movie “Darjeeling Limited.”—appropriate that it was a train movie. Just thirty minutes later, we were walking from the train to Versailles with other tourists in a downpour—the wind blowing so hard our umbrella was blown inside out. We squealed, and laughed, and fought the wind to restore our protective umbrella, then huddled underneath it. It was a very good day for the souvenir salesmen crowd the Versailles gates peddling knicknacks—today the tourists couldn’t give them their money fast enough for umbrellas. I liked a pink Marie Antoinette umbrella but we brought our own –we could have brought two umbrellas, but being optimists, we didn’t really think it would rain. Now we both clung to one umbrella. A line snaked around the building, tourists flattened against the wall trying to stay warm. “Do you want to go back?” I asked. The skies had become charcoal, thunder richocheted off the buildings, rain was pouring down. “No, we came this far. Let’s go to Marie Antoinette’s house.” Anna said, a fan of the Sophia Coppola movie with Kirsten Dunst. “That’s the spirit!,” I replied although I wouldn’t have been sad if she said let’s go back We paused at the top of the stairs to survey the kingdom below. “King Louis claimed that he designed every blade of grass,” I said. Anna nodded, or shivered, I wasn’t sure then looking down she began laughing hysterically. “Look!” she laughed and pointed at my pants. My pant legs were so soaked I could wring them out. We sloshed down the stairs past the fountains spraying and classical music played from massive Bose speakers. On Saturdays and Sundays Versaille presents the lovely Grandes Eaux Musicales and on a sunny day, it’s wonderful, but today it seems misplaced, we are the only people out here for the moment. “ Let’s pretend we are royalty descending the stairs,” I say and we laughed at the absurd picture of two drowned rats trying to descend the royal stairs to the royal gardens in a regal way. The rain stopped. We took this opportunity to walk down the statue lined path to a tree covered road that leads to the Grand Trianon and the Petite Trianon where Marie Antoinette hung out. During previous visits to Versailles, I have seen the palace grounds full of merriment: boaters paddling in the grand canal, bicyclists riding around the Palace Gardens, picnickers by the lake, joggers on the paths, restaurants overflowing, ice cream stands surround by customers. 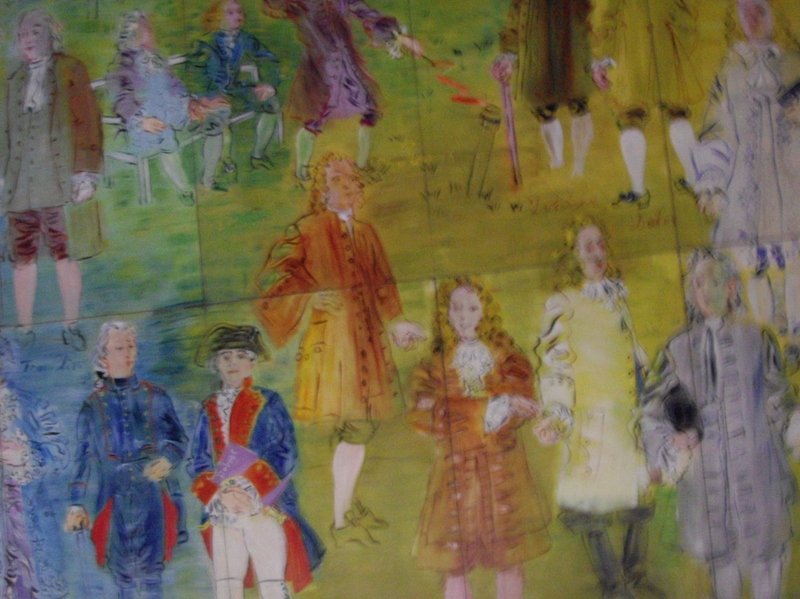 On this day, however, not so much merriment, a different view of Versailles..
We toured the Grand Trianon and made our way to the adorable Petite Trianon where Marie Antoinette enjoyed living in a country house like a peasant and kept chickens and sheep. A black cloud loomed ominously above and Anna said, “I’m okay with going back now”. A few minutes later, the rain began. By the time we reached the parking lot we would have paid a ransom for a plastic poncho–our umbrella protected us from one out of every ten raindrops. We reached the train station just before the train departed and slid into an empty seat. The umbrella left a puddle on the floor. A young couple sat across from us kissing and eating chips. We were chilled to the bone, happy to be inside the train’s warmth, rocked gently as it moved down the tracks. Anna handed me a headphone. “That was an adventure, mom,” she said placing her headphone in her ear and snuggling against the window. “Sure was, I said but she didn’t hear. This time, we listened to Eminem,making our way back to Paris. Just outside Issy-val du Seine, out of nowhere, a wave of melancholy washed over me. In a few years Anna will be in a college dorm somewhere listening to Eminem or Mackelmore. Or maybe sitting on a train next to a boy eating chips. It was yesterday that we listened to the Backstreet Boys together on an airplane to DisneyWorld. How fast time goes like a train to Versailles and how happy I am that I have been on the ride sharing a headset. Today Anna and I stopped by Angelina, famous for its choc-chaud (hot chocolate) before venturing to the Louvre. We were dying to see what all the fuss was about—hot chocolate is hot chocolate, right? Unless it’s chocolate cake batter. This drink is so thick that Anna vascillated between sipping it and drinking it with a spoon. She drank half a cup, pronounced it delicious, then complained of a stomach ache. Warning: do not go to the Louvre with a stomach ache. Several years ago, my husband Ken and I toured the Louvre in twenty minutes. We were on our way to see the Mona Lisa, maneuvering our way into the museum’s interior amidst bus tour groups, when Ken started sweating and shaking and said, “I’ve never been claustrophic before but I need to get out of here. Now.” So our total time was twenty minutes from the time we entered to the time we stood outside the Pyramid. Today, Anna and I made a similar plan. Museum-lovers may want to cover their eyes now because of what I’m going to write. Neither of us wanted to visit the Louvre but we felt we had to. 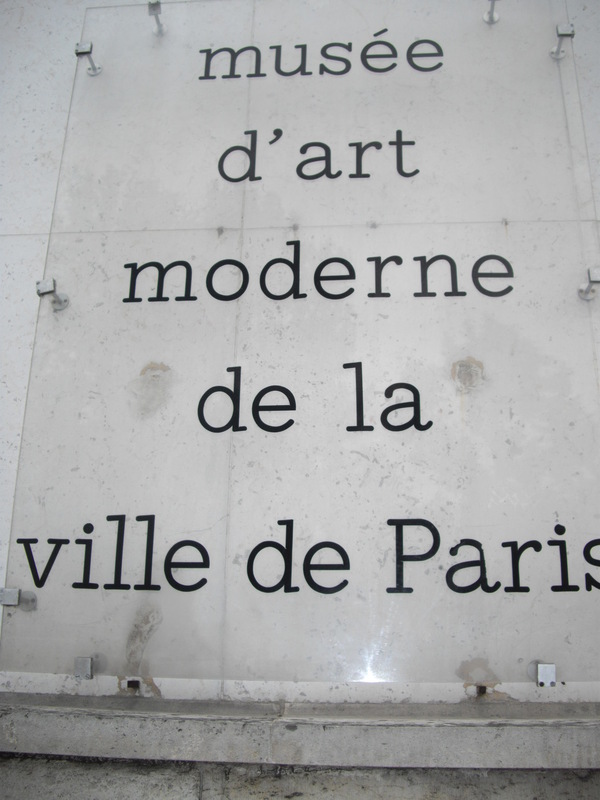 We enjoyed modern art museums, plus we were looking forward to the D’orsay and Orangerie but we didn’t really care about all that madness of the Louvre. However I felt I would be a bad mother if I didn’t at least take Anna to the Louvre-I could imagine her teachers asking her, “Did you visit the Louvre?” and their shocked expression when she said, “Non.” She wanted to see one thing; the Mona Lisa. So we entered the museum with this mission in mind and set the timer. It was cloudy and overcast today, maybe in the 60s, but inside the Louvre it was a humid hothouse. On a 90 degree day the Louvre would be unbearable. Plus, the crowds! It is impossible to move more than a few feet at a time–there are so many thousands of people crammed into the hallways. To get close enough to see a work of art, one must wait in line for a turn, so it’s possible to spend a lot of time waiting in each hallway. We followed the signs to the Mona Lisa, we zig-zagged through the crowd, and there she was smiling at us from afar. Voila! Anna was happy to see her and then said, “Let’s get out of here.” We rejoiced when we stepped outside into the fresh air and continued on our way. We walked through the Palais Royale, past the beautiful Place Victoire, Saint Eustache, and Chatelet Halles. We stopped in a store that sells European design magazines and a clothing store that sold adorable eyelet skirts, then continued window shopping along the way back to our hotel. It was a splendid day. No doubt, the Louvre is full of treasures. But so are the streets of Paris. 1. It is work to understand modern art. See example below. 2. Maybe I’m a little slow. 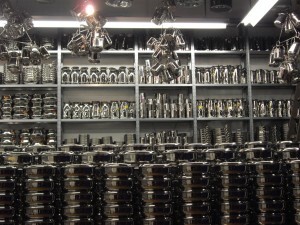 When I saw a piece that was an entire wall of telephones, cell phones, chargers, cords, computer cords, I had to ask myself “what does it mean?” Anna shouted out ” too much technology”. I thought it was a message that electrical items need recycling. When I read the exhibit notes it was about how technology is taking over our world. 3. 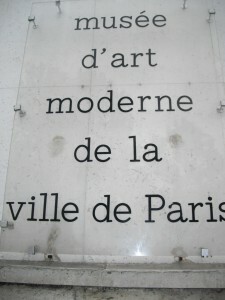 Modern art is noisy. At the exhibit today we heard a saw, a bathtub being filled, a static-y radio, a tantric choir. At other museums, I’ve heard tour groups talking and the random lone ring of a cell phone but they aren’t part of an exhibit. 4. 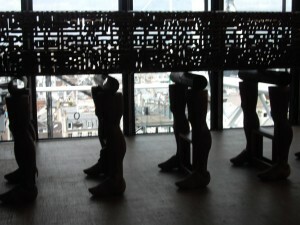 Modern Art can use anything it wants in a work of art: video, twigs, pots and pans, wooden feet. See example below. 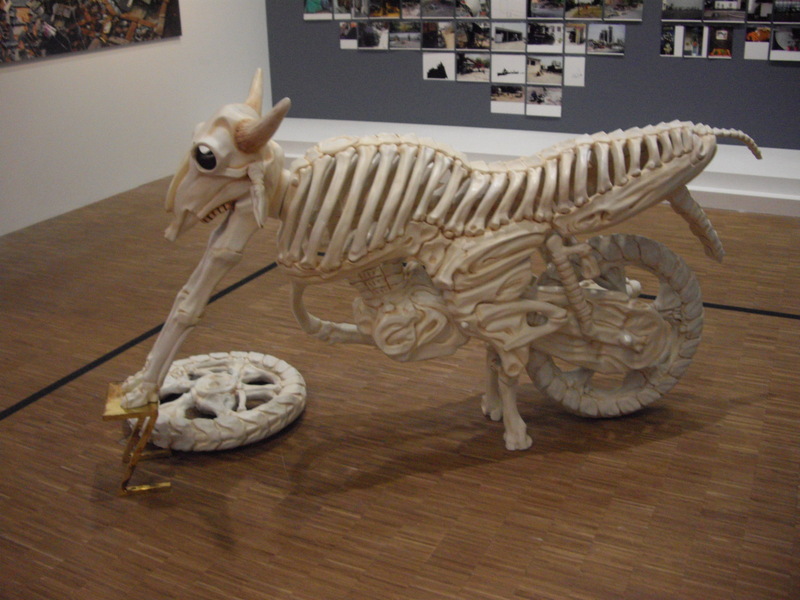 In a special exhibition called “Paris, Delhi, Bombay”, one installation called Ali Babba took up a whole room. It looked like a stall you might find at a marketplace piled floor to ceiling with stainless steel pots of every size and shape. It was a cook’s dream. I watched a woman pick up a pot and turn it over. “Excusez moi?” a guard said kindly. (I was surprised she didn’t say it with more indignation like “Excusez moi!) The woman asked how much the pot was. The guard responded that it wasn’t for sale. I read the note card about the exhibit and it said it was modeled after the abundance of a bazaar, where so many come with their money to shop–so much excess–while millions in the world are hungry. I thought the artist would have been amused by the woman offering to buy a pot. But I have to admit, I wanted to buy a pot too. When we walked back to our hotel from the Pompidou we saw a yellow balloon in the river Seine. It wasn’t moving like one would expect to see a balloon on the river float, more like a balloon that had an anchor on it. “Hmm that’s unusal,” we said as we watched it. Modern Art installation we agreed as we walked home. During my previous visits to Paris, I’ve rented an apartment—historic spaces with windows that you could throw open onto the street, light that streamed inside, a true Parisian experience. 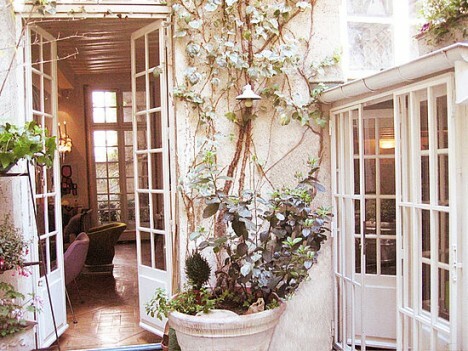 ( I did not rent Chrisitan LaCroix’s apartment but a girl can dream.) This time I decided to try a hotel. Although an apartment was nice for the extra room and the je ne sais quoi, it’s also work. You do your own housekeeping and cook your own breakfast. The hotel on the other hand is not as roomy as an apartment but it has many advantages: an elevator to haul our large suitcases up five flights of stairs, car service from the airport, air conditioning, breakfast and maid service. Since we are only in the room to sleep or read, using the cafés of Paris as our living room, we haven’t been bothered by the lack of space—yet. I’m not saying I’ll never rent an apartment again—I may. 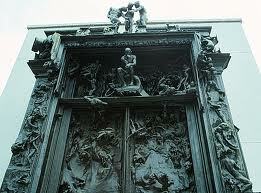 However, the hotel is making my life easier and giving me more time to explore Paris with Anna. Today we visited the Rodin Museum and I bought a four-day Museum Pass–a fabulous deal that saves money at museums plus allows you to skip the line and walk right up front. To make it even better, most of the museums in Paris offer free admission to anyone under age 18 so Anna’s ticket was complimentary. As we strolled through the museum located in the old Hotel Biron where Rodin once lived, Anna admired the building as much as the sculptures. We imagined what it must have been like to live in such a beautiful hotel. We walked through the rose garden and I took her photo next to The Thinker before admiring more sculptures. As we walked past them, Anna amused us by narrating a story about the sculptures in the garden about how one statue, a trouble maker, started a fight with the others and causing one statue to lose its head (Headless Hercules) while others covered their faces in shame. Before leaving the museum, we saw an adorable preschool class lined up for a picture in front of The Gates of Hell, an amusing contradiction, these cherubs smiling in front of Rodin’s tortured work. As we walked back to our hotel, down the Boulevard Saint Germain, a French woman approached me and asked “Ou est Saint Severin?” (Where is Saint Severin?) Anna was delighted. “She must have thought I was French too!” she said. When we returned to our hotel room– cool and quie with beds neatly made–we realized, like Rodin, how we appreciate a nice hotel. We may never leave. Paris rain is the most beautiful rain, humbling plain old wet raindrops worldwide. 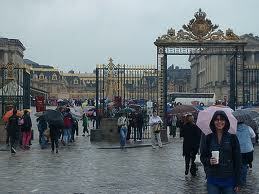 If you’ve seen Woody Allen’s Midnight in Paris, you’ll know that to truly embrace Paris, you must enjoy the rain. Today, Anna, my 17-year-old daughter and I set out on our first day of adventures on a morning with a small chance of rain. Our plan for the day: walk to the Luxembourg Gardens, followed by lunch on the terrace of Les Deux Magots, and finishing the day in the Rose Garden of Rodin’s Musee with an ice cream. But within the first block we felt sprinkles and by the fourth block we were caught in a lovely down pour. We marshalled our umbrellas and continued for several blocks but realized we needed to shift to plan B. 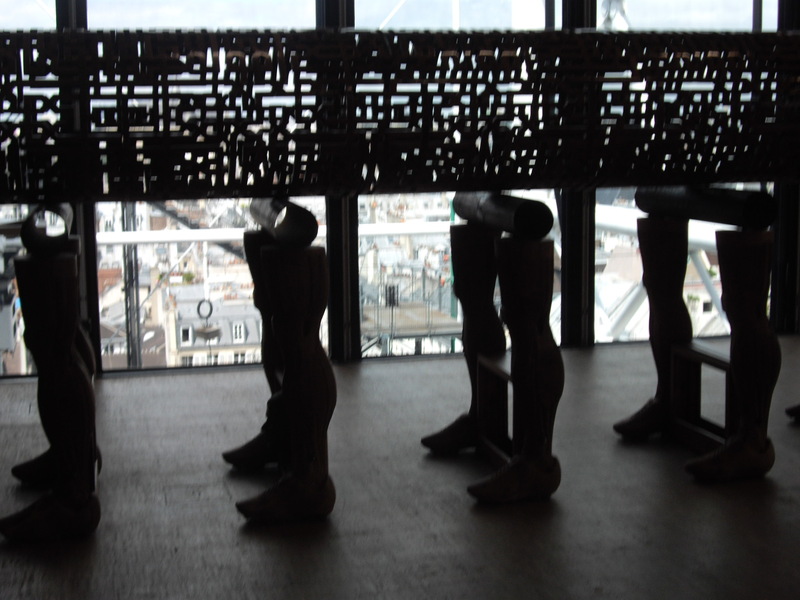 Since it was a day suited to indoor-activities, we decided to visit the Musee d’Art Moderne de la Ville without knowing whether the museum was open or its current exhibitions. It was our lucky day—the museum was open. We shook off our damp umbrellas walked up stairs in the cavernous white entry-way eading to a temporary exhibit hall with a sign Raoul Dufy. Inside was la fee electricite a mammoth painting,624 square meters, floor to ceiling, three walls, with so many intricate details that its hard to imagine how long it took to paint. I stood with my mouth gaping for a while, and then just basked in it’s lovliness. 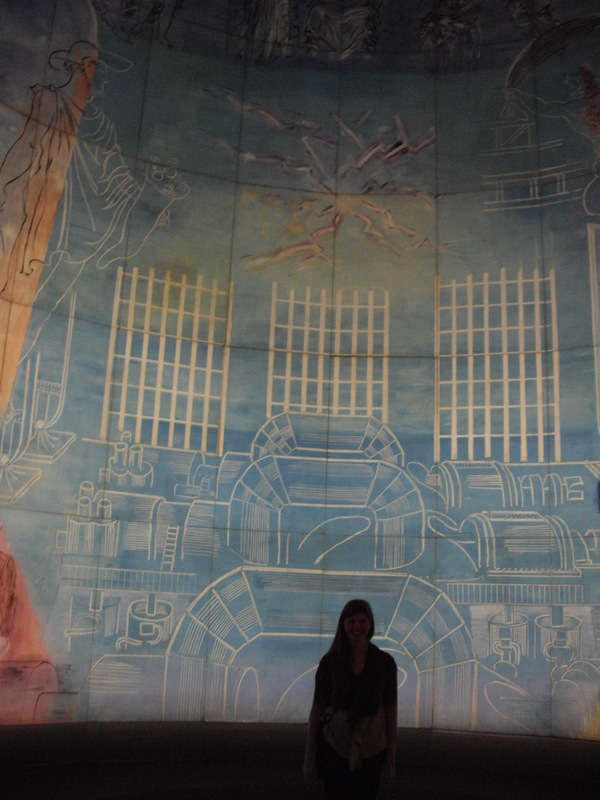 Below are a few photos taken without flash and including Anna’s shadow. 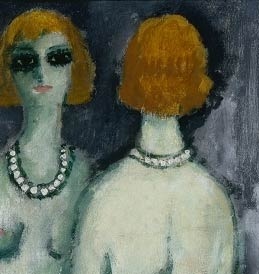 We also enjoyed the retrospective of Kees Von Dongen, remarkable in its depth. 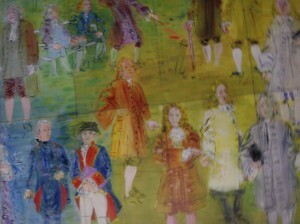 Each salon is devoted to a different period of time and stylistic period of his art. A Dutch rebel, Von Dongen moved to Montmartre in 1898 where his first success was a showing of drawings and a new series of pictures. Through the years, as he developed his talent as a painter, he worked in a neo-impressionism style, portraits and nudes in primitivism, and exotic paintings from travels to Spain and Morocco. After the museum, the rain had stopped so we walked down George V to the Champs Elysee, strolled down the wide boulevards, and ate lunch at an overpriced outdoor café. 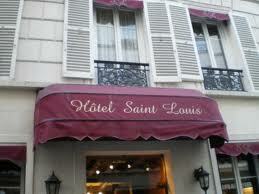 We took the metro back to Hotel de Ville and walked over Pont Marie to the Isle Saint Louis to our adorable hotel. Café De Flore today is a popular hangout for the publishing and glamorous world. However, it still retains authentic Paris charm and on a recent visit I observed a french husband and wife sitting on the patio with their petit chien in an animated discussion with a friend who met them for lunch. (The petit chien did not participate in the discussion, however, content to sit underneath the table and hope for a bite to eat.) My favorite lunch choice is the Salade Flore–how do they make a simple chef salad taste so remarkable? Les Deux Magots: Named for two superb Asian statues inside the café that have been watching over the terraces on the Place Saint Germain des Pres for over a century, Les Deux Magots has been a watering hole for the intellectual set of Paris since 1914. Auguste Boulay, an ancestor of the present owners, created the café “Les Deux Magots” and soon it became the place to “see and be seen” as legendary figures of the world began frequenting the cafe. In the 1920s, Ernest Hemingway stopped by the café to talk with Jean Paul Sarte, James Joyce or Janet Flanners. The club sandwich is the best club sandwich in the world and I like to pair it with a glass of vin blanc and sit on the patio. Closerie de Lilas: Located in Paris’ Montparnasse, at the tip of the Luxembourg Gardens, is La Closerie de Lilas, the lilac arbor. It has attracted everyone from Henry James to Leon Trotsky to Gertrude Stein and Hemingway—who wrote the Big Two-Hearted River and The Sun Also Rises while sitting in the bar. My favorite “Parisian” literary café–maybe because it is less frequented by tourists and very popular with Parisians–I could sit here for hours. On my last visit I was surrounded by Parisians taking long lunches, drinking wine, and discussing politics—I felt so french! The food is fantastic—from the jumbo shrimp cocktail to the jambon and melon salad, I was in heaven. 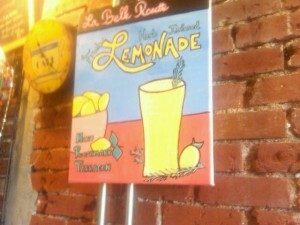 In the Washington Park neighborhood of Denver, a lovely-french inspired petite coffee shop La Belle Rosette makes the best lemonade, ever. They call it Citronique and it’s herb-infused–this month’s variety is lavender but the herb infusion changes each month. 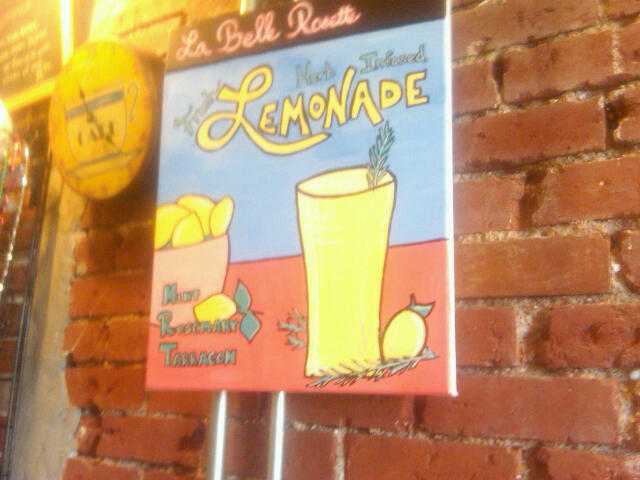 Next they will offer Citronique Tarragon and additional future flavors include Rosemary Lemonade, Ginger Lemonade and Mint Lemonade. 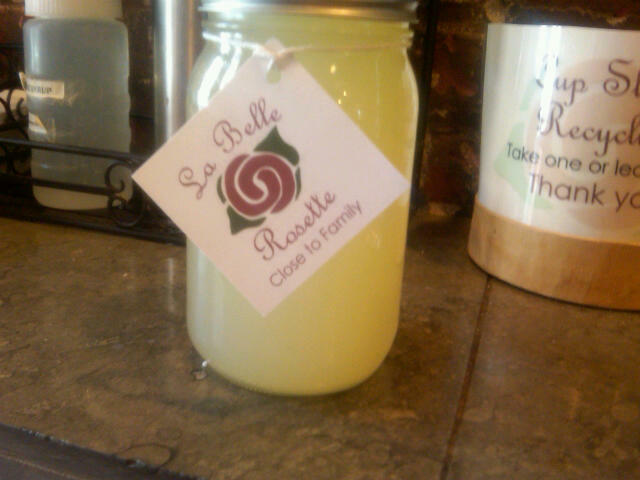 The delicious lemonade is served in a one-quart mason jar for $4.99 and if you return the lid and jar, you’ll receive one dollar off your next quart of lemonade. 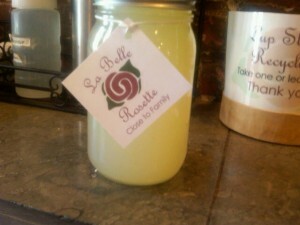 The folks at La Bell Rosette have to work hard to keep it in stock because it is so popular. In fact, it is so popular that they are working to bring Citronique lemonade to a market it near you—you can follow them on this journey on Facebook. In just four short months I will be flying to Paris to spend June in the City of Lights. This year, I’ll bring my teenage daughter Anna for ten days followed by ten days with my husband Ken. Last summer when I left Paris, I had planned to rent the gorgeous apartment on St. Louis en L’isle—light streamed through the large windows opened onto the street while hard wood floors and high ceilings provided historic character. Located in the heart of Paris—the location was ideal. And our landlords, next door, attended to all the little issues that arose like the refrigerator door that wouldn’t close and the internet code that didn’t work. I vowed to rent the apartment again this summer. But since then I’ve had second thoughts. Paris is making it more difficult for tourists renting apartments in the city—Paris officials want these apartments available for Parisians to rent year round. According to an article in The New York Times, to legally offer short-term rentals, owners would need to have their residential properties reclassified as commercial sites, a complicated process that involves finding a commercial property in the same neighborhood that can be transformed into residential use. Without such a permit, any apartment classified as residential in a French city of more than 200,000 must be offered with a minimum one-year lease. The law, passed in 2005, has some exceptions for student housing. I’m looking for a low stress answer to my Paris vacation and becoming entangled in the Paris apartment rental laws is not in the picture for me. 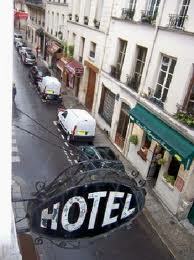 After investigating hotels on the Ile Saint Louis I found what seems to be a perfect match. And the bonus of staying in a hotel is air conditioning, an elevator, car service from the airport and complimentary breakfast. 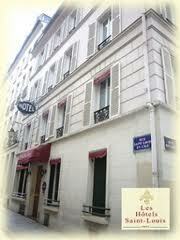 So as much as I’ll miss my Paris pied a terre, I’m looking forward to my pampered month in Paris at a hotel.